Is it just me, or have there been an awfully lot of tempting apple cakes out there lately? I’ve wanted to try them all, but I knew what would happen if I had an entire, big apple cake in this house. It would disappear too quickly, and I would need to spend a lot more time in running shoes. When I found this recipe for apple muffins, it seemed like a perfect compromise. Kurt loves muffins for breakfast, and a few could go into the freezer for a later date. The other part of this story is that one of those cake recipes that is tempting me involves apples and blackberries. 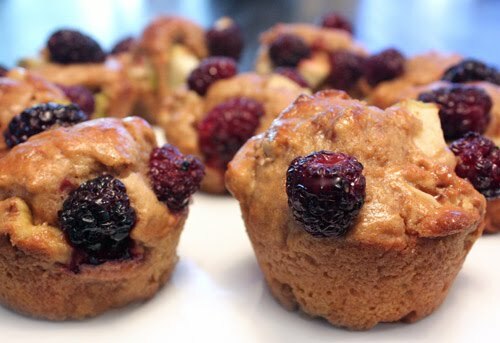 When I found some fresh blackberries from Mexico at the grocery store, I had to add them to the tops of these muffins. I found the recipe on Epicurious, and it’s from the September 1997 issue of Gourmet. My only changes to the original recipe were to bake the muffins at regular size rather than as mini muffins and to top them with blackberries. I left the apple chunks slightly bigger than one-quarter inch pieces and didn’t chop the walnuts fine either, but no big changes. While the muffins were baking, apple cider was simmered until reduced to a syrup. When the muffins were removed from the oven, they were poked on top with a skewer and then brushed with the syrup. 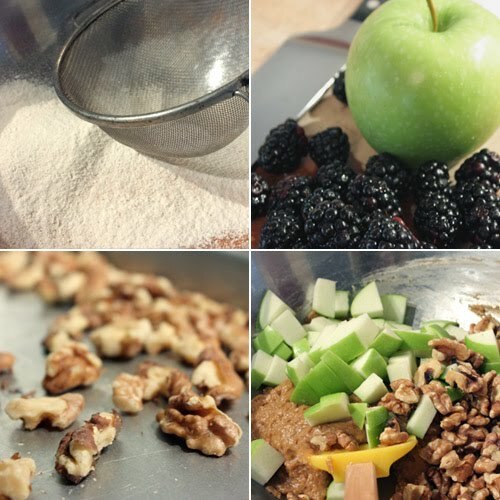 With apple chunks, walnuts, apple cider, and blackberries in the muffins, these were full of delicious. The syrup glaze on top kept the muffins moist and gave them a little shine. The walnuts were particularly nice with the flavor of apples and cider. This was a practical choice for satisfying my apple cake craving, but that doesn’t mean I won’t change my mind and bake a big, full cake in the very near future. These look scrumptious! Especially with all the fruit sticking out of it! These muffins look really delicious! How come everything you make always looks so fab??? Apples are everywhere and I am loving it! I have a huge bag in my cellar just waiting to be baked up into something delicious. Like these muffins! The blackberries sound yummy and the apple cider brushed on top is a really good idea. They look marvelous, especially like the whole berries. You are right, I am seeing apples everywhere and the worst part is; I haven't baked anything with them yet! Love your apple muffins! The blackberries on the muffins look SO great!! Oh, what delightful muffins! I love that fabulous combo! That sound delicious Lisa, seems like everyone in the mood of muffins these days. Amazing delicious and healthy too! tis the season for apple cake, there's no doubt about that! using cider in a glaze is a really good idea, and perfectly appropriate for your lovely muffins. Those look delicious... and I love the blackberries sticking out all over. The glaze adds the perfect last touch. I love the apple/blackberry combo and those big juice berries poking out on top! They look so good. I love blackberries. Okay, I didn't quite hit 'L' yesterday afternoon . . . but I did finally make it! There are cakes out there all the time, as far as I'm concerned! Including yours! I love your muffins with the whole berries and it being sunday morning here, I wish I could have one or two right now! Oh yum, cider glazed apple muffins sound perfect with a pot of tea. With blackberries too, you have me running for the market! 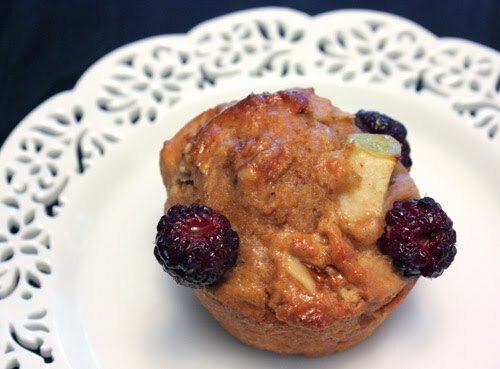 Your muffin has all the wonderful breakfast goodness ... love the assortment of fruits and nuts!